The Fox Inn is a traditional 17th Century Cotswold Country Inn, with a real sense of atmosphere which makes it somewhere rather special – a hidden gem within a beautiful part of the Cotswolds. 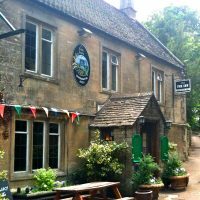 The Fox Inn is set in the beautiful village of Great Barrington just a few minutes away from Burford on the Oxfordshire – Gloucestershire border. The Fox Inn boasts one of the most amazing settings for a pub you will ever find with a heated patio area beside the banks of the river Windrush, a wonderful riverside garden, amazing food and hard to find but delicious Donnington Ales (brewed just up the road at the Donnington brewery in Stow on the Wold). This is the perfect pub to sit and unwind on a summer’s day before exploring the many footpaths that wind their way through the stunning Cotswold countryside. Whoever we meet in life, whether it is a world leader or the barmaid at our local pub – everyone deserves equal respect and we must all learn to show our appreciation for those that give us their time or their services.